My last three posts have looked at Movement for a Democratic Society (MDS) and the organisation's relationship to Barack Obama and his campaign. Every one of these strands has supported Barack Obama since at least the mid '90s-some even further back. Today many MDS activists are working in the Obama campaign, particularly through the MDS offshoot, Progressives for Obama. Much as been written about the links between Barack Obama and his "patrons" former Weather Underground terrorists Bill Ayers and Bernardine Dohrn. I've shown that Dohrn has been an MDS board member, while her husband Ayers is at least an active supporter. That's two known former terrorists involved in MDS, but there are at least three more in the MDS/Progressives for Obama orbit-Jeff Jones, Howie Machtinger and Mark Rudd. Ayers, Dorhn, Jones, Machtinger and Rudd are old revolutionary comrades. 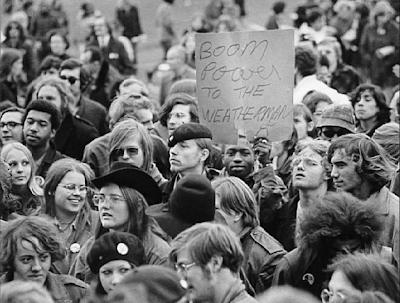 In the late '60s the five were key leaders of the faction of (SDS) that split to form the Weather Underground. All attended the famous 1969 Flint War Council that effectiveful gave birth to the Weathermen faction of SDS. All were virulently anti-American in their radical heyday. Bernardine Dohrn has been accused of planting a bomb that killed San Francisco policeman Brian V. McDonnell. 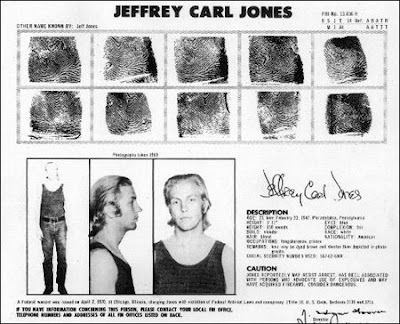 When police raided a Weathermen bomb factory in Pine Street San Francisco in 1970, they found the fingerprints of Ayers, Machtinger and Rudd. All are still radicals today and all are proven Obama supporters. This post profiles the three neglected Weathermen in the MDS/Progressives for Obama network-Jones, Machtinger and Rudd. Jeff Jones went to his first rally against the Vietnam War in 1965. Within a year, he had quit Antioch College to become a fulltime organizer for Students for a Democratic Society. In 1966 he traveled to Cambodia to meet with high-level leaders of the NLF. 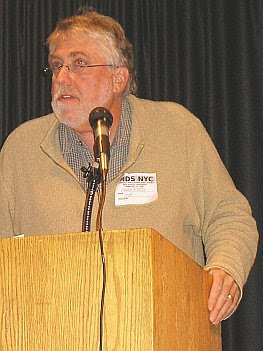 In 1967 and 1968 he served as SDS Regional Organizer for New York City. In 1969, he was elected, along with Bill Ayers and Mark Rudd, to SDS national office. Then, in the spring of 1970, he disappeared. 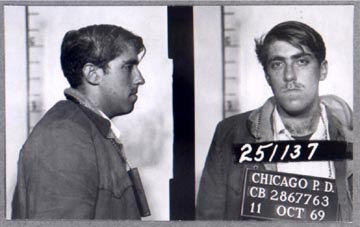 As a leader of the Weather Underground, Jeff evaded an intense FBI manhunt for more than a decade. In 1981, they finally got him. Twenty special agents battered down the door of the Bronx apartment where he was living with his wife and four-year-old son. Jeff Jones serves on the board of MDS. Jeff Jones is also a signed up supporter of Progressives for Obama. Today Howard Machtinger is director of Teaching Fellows at the University of North Carolina. 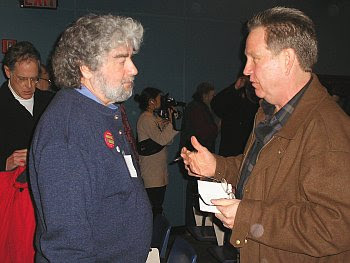 Machtinger is not a confirmed member of MDS, but does contribute to Next Left Notes, which is edited by MDS board member and Progressives for Obama endorser Tom Good. Ayers, Dohrn and Rudd are also Next Left Notes contributors. Machtinger has signed on as a supporter of progressives for Obama, on the same page incidentally as yet another former Weatherman, Steve Tappis. Further along Jennifer Dohrn-sister of Bernardine Dohrn has also signed up. If we, as a Left, are content to smugly and dismissively critique the Obama phenomenon, we trade self-fulfilling sectarianism for the chance at political impact. A victory for Obama will not only be a boon for the African-American community and for people of color, it will offer a unique opportunity for the development of an organized and aggressive Left movement that retains its independence at the same time that it is willing to risk everyday involvement in the strange world of American politics. Today Mark Rudd is a New Mexico school teacher. According to the FBI Mark Rudd's trip to Cuba also involved terrorist training in camps set up by Soviet KGB Colonel Vadim Kotchergine. Today Mark Rudd serves on the board of MDS. Rudd is also an endorser of Progressives For Obama. Clearly Bill Ayers and Bernardine Dohrn are not the only former Weathermen backing the Senator from Illinois. Add their old comrades Jeff Jones, Howie Machtinger, Mark Rudd and even Steve Tappis to the mix and you are starting to get beyond coincidence. That former terrorists are working with Marxist groups to elect Barack Obama is beyond doubt. Should US voters know this? Are we to assume that everyone working for or ever affiliated with the McCain campaign is squeaky clean? I'll bet if folks were searching in McCain's backyard, they'd find something there, too. How about the issues? Are we focused on how our tomorrow looks or on how someone's insignificant yesterday was? So Obama is bad because of supportes of his? your logic is as weak as your backbone. Show that Obama has ties to them in a supporting role not that a few of the thousands that support Obama are bad apples. there are way too many unanswered questions for Mr. Obama. So what you are saying is that experiences do not matter? I assume you support Osama, er um, Obama? If experiences do not matter, then your party's challenge about Senator Palin's qualifications (should something happen to McCain) as President are moot. You can't say past experiences don't matter for your side and then attack mine for the same reason. And PS my side says the past does matter. Check the records. They are clear. If you want no rights, higher taxes, more problems, no military, no defense and the same problems France and Germany have had for the last 2 decades, go live there. You want free health care? Move to England or Canada. If you want a free, strong America, vote McCain. And before you uppity Oxford types say those aforementioned countries are great because mommy and daddy let you go to school for a semster there, I'll tell you they ain't all that, because I've lived and worked there. Every time i see someone use the Osama "oops" Obama phrase, or intended mistake it makes me laugh and truely question there statements. We all know that because someones name is close to another they are the same right? LOL. All i can say is Fanatical JM supporters almost always use comparisons that mean nothing, to try and make themselves or there side look better. Just realise already ITS OVER Obama has won. JM would need to do what Bush did in 2004 and buy votes at this point in order to win. One of the many “anonymous” commentators asked about McCain’s background and his ability to stand up to the scrutiny. I have to say that traditionally [whether we like it or not] the US main stream media is truly left leaning and tend to support the Democrat party, the closest they come to supporting a Republican is someone like McCain who is truly a moderate and has had his fair share of arguments with the RNC. McCain ran for president in 2000 and did not make it out of the primaries as he was ruthlessly attacked not only by the other candidates as “too moderate” but also by the media. Additionally, let’s talk a bit about Sarah Pallin. She has been beaten up by the media and set up to look as foolish as possible. Yet, when you look at the Governor from Alaska, and the 300 plus researchers sent up there to dig up dirt on her, all they found was: 1) Her daughter was pregnant, 2) Troopergate and 3) the RNC spent $150 thousand on her clothes. Not a lot for all that expense, don’t you think? Now to the real issues of the campaign, let me quote my least favorite president since Jimmy Carter, Bill Clinton who’s first campaign was renowned for the internal slogan “It’s the Economy, Stupid”. Bill Clinton, if I were dead I’d roll over in my own grave for saying this, had that right back then and he has it right today. Too bad Obama does not. First, in a recession, [yesterday the US government published numbers that show that the 3rd Quarter GDP dropped 0.3% (first of two quarters in a row needed to define the start of a recession), today the government also published that income fell by an average of 0.3% and that consumer spending fell by also an equivalent 0.3%, I think we can agree that if we’re not in a recession today by definition, we certainly shall be by January when the numbers come out] the last thing you want to do is raise taxes on businesses. Senator Obama proposes raising taxes from 35% to 39.5% taking 4.5% off the top of every business in the United States with income greater than $250,000 (or is it $200,000 as an Obama add said, or is it $150,000 as Joe Biden said on October 30th, or is it $120,000 as Governor Bill Richardson of New Mexico said today). He further plans to raise dividend and capital gains taxes from 15% to 20% further eroding investor confidence. These two tax increases alone will take re-investment capital from business when it needs it the most, in the middle of a recession. The last time such tax moves were made, it was during Herbert Hoover’s presidency at the beginning of the Great Depression, and then again during Franklin Delano Roosevelt’s presidency that further eroded business ability to increase employment by increased labor costs plus increasing taxes to almost confiscatory rates. Obama pushes for larger government, the loss of secret ballot union elections (note the similarity to FDR’s errors 70 years ago), the transfer of wealth through increased taxes, and further increase in taxes to cover the one trillion dollar government expansion plans. The election of Barrack Obama, is not only a problem for the United States, but also for the rest of the world since all the economies are now so globally tied together that anyone of the major 8 economies can bring the rest down, and Obama has all the ingredients of pushing us into a deep recession, or even into a depression. These are the real issues of the campaign, the fact that he is connected to radical left wing activists with socialist tendencies just goes to support the depth of his belief in socialist ideals of large government, government control, high taxes, redistribution of wealth, nationalized retirement plans (say bye bye to the 401(k), per Barmy Franks), and nationalized health care. They are truly all tied together. Please don't forget or discount his stand on abortion and the Right to Life - one of the best videos this election has been the one at this link - please take a moment to view it. There is nothing more important than Life itself.